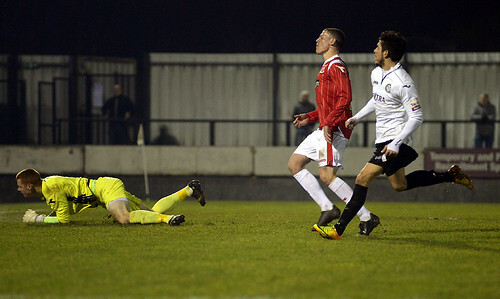 Hednesford Town started the defence of their Birmingham Senior Cup trophy with a confident 3-1 victory over Walsall, thanks to a hat-trick from striker Wayne Riley, writes Scott Smith. Manager Rob Smith made just three changes to the team that had taken on Gateshead at the weekend, with Paul McCone, Alex Melbourne and Michael Lennon coming in for Francino Francis, Kris Taylor and Neil Harvey. Against a young Walsall side it was the more experienced Pitmen that started the game better, with Elliott Durrell seeing a free kick palmed behind for a corner before Ben Bailey saw his shot go just wide of the upright from the edge of the box. Durrell soon followed this up with another low driven effort which just beat the post before Walsall finished the half with a succession of corners. 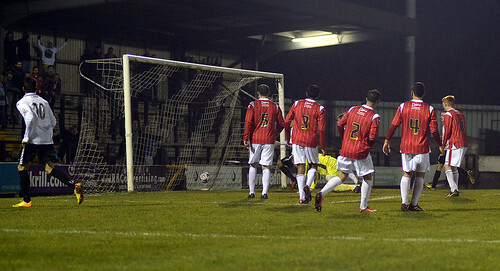 However neither team really tested the opposing goalkeeper as the sides went in level at the break. Despite Hednesford starting the second half the better of the two sides, it was almost the visitors who went ahead after 52 minutes when James McQuicken cut inside from the right before dragging his 20-yard effort wide of the upright. It would be Town who would edge ahead though in the 69th minute. Following a scramble for the ball inside the Walsall penalty area, Riley managed to work some room for himself before poking home past Shane Lewis in the Saddlers goal and in via a post. Two minutes later it was 2-0. A long ball down the middle wasn’t dealt with by Walsall’s Aris Christopherou who was unable to get enough on his back header and Riley was on hand to slot the ball through Lewis’ legs into the net. With seven minutes remaining the hosts almost grabbed a third as Durrell played a short corner to Darren Campion and after receiving the ball back, saw his curling effort strike the crossbar and rebound away to safety. But it would be the visitors who would strike next as the clock ticked onto the 90th minute, with substitute Carlton McKenzie lobbing Dan Crane in the Hednesford goal to give his side a glimmer of a chance. This was soon snuffed out though when Durrell flicked the ball on for Riley to race clear and finish smartly past Lewis to complete a memorable evening for the front man. Hednesford will now prepare for their return to Skrill North action when on Saturday they travel to Cheltenham to take on Gloucester City, with a 3pm kick off at Whaddon Road.